In the mid 1940s Rev JG Guinane SJ arrived to teach in Crescent College SJ Limerick. A charismatic individual with a whiff of excitement about him, he had been in action during the war as a Chaplain with the Royal Ulster Rifles. He was passionate about the game of rugby and probably Old Crescent Rugby Football Club owes its existence to ”The Ginner“ as he came to be called. Taking over rugby training he set about winning the Munster Schools Cup and succeeded in 1947. He saw great potential in that winning team and persuaded them to stay and play together so in September of that year Old Crescent Rugby Football Club was founded and became a member club of the Munster Branch of the Irish Rugby Football Union. In 1952 the club was promoted to senior club member of the Branch and the Ginner‘s formidable negotiating skills were more than useful in the process. Father Guinane remained deeply involved with the club until his death. The first President of the club was Ivan Harris, father of the legendary Richard Harris, movie and stage star. Richard started his adult rugby career with the club for a period after he finished at Crescent College (and appropriately Richard‘s big breakthrough as a film star was in 1963 playing the part of a rugby player in “This Sporting Life”). First club Captain was Paddy Berkery who in 1955 was capped as fullback for Ireland having moved to Dublin and joined Lansdowne. 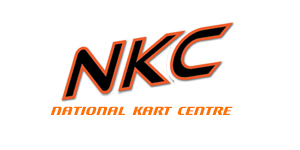 Membership of the club was initially confined to past pupils of Crescent College but it soon became apparent that this limited the club‘s growth and membership has been open to all applicants for many years. Contact is maintained with the school (now the Crescent College Comprehensive SJ) where we are always willing to help promote rugby. In the 1950/51 season, an interesting development occurred when the Club decided to field two more or less separate teams, one of which concentrated on playing in the Transfield Cup with the other seeking to play senior grade teams. 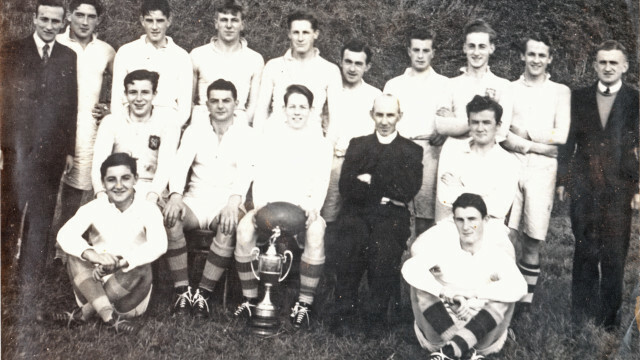 The Transfield Cup was won in January 1951 and this followed a victory the previous week over the Old Belvedere senior side. With these promising results, the Club looked forward with confidence to the Munster Junior Cup campaign and duly reached the final only to be defeated 5-3 by Cork Constitution at the Mardyke. The 1951/52 season was to be a most significant one. With the influx of a large number of highly talented players from the school, the playing strength of the club increased tremendously. Under the presidency of DG O’Donovan they quietly set their ambitions on attaining Senior status. Thanks to the dedicated diplomacy of Fr. Guinane and Jim Roche, this goal was achieved and at a Munster Branch meeting on 12 June 1952, Old Crescent RFC was granted Senior status along with Highfield RFC. In its early years as a senior club the Club maintained the level of performance it had shown in the junior ranks. In 1952/53, the first as a senior club, the Club reached the semi final of the Munster Senior Cup and were defeated 6-3 by Garryowen. In 1954/55 the Club was honoured with its first senior interprovincial when Jim Roche was selected for Munster. That year the Club reached it’s first Munster Senior Cup Final and were defeated 17-8 by a star studded UCC side. As the years passed, a new group of players emerged to represent Old Crescent and they brought great honour to the Club both on and off the field. In 1961/62 under the captaincy of Billy Leahy, the Club again reached the Munster Senior Cup final and on this occasion they were defeated by a Bohemians side containing the legendary Mick English and Bill Mulcahy. In 1964 the Club was honoured when Paddy Lane was selected to play for Ireland against Wales. Off the field Old Crescent was also evolving and growing. 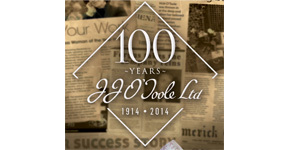 The increase in the playing membership dictated that the Club look for a new home. 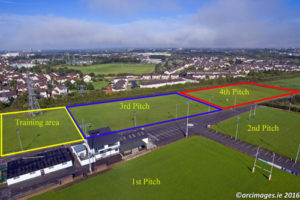 A fund raising drive was started which resulted in the purchase of new playing fields in Rathbane and the opening of a new clubhouse in 1968 by the then president of the IRFU, CP Crowley. The move to Rathbane did not bring any improvement to the Club’s playing fortunes but in 1976/77 the Club won it’s first senior trophy when it captured the Limerick Charity Cup. In 1975 the Club purchased the school playing fields in Rosbrien from the Jesuit Community, and in the early 1980’s it was decided to move permanently to Rosbrien. The grounds at Rathbane were sold to Limerick FC and in 1983 the new clubhouse in Rosbrien was opened. 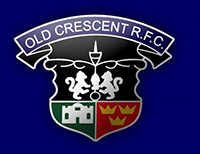 Old Crescent continued to prosper in its new surroundings and made the breakthrough at national level in 1992 when the Club qualified for Division Two status of the All Ireland League by winning the Munster Senior League and defeating NIFC, Clontarf and Galwegians, in the all Ireland round robin competition. We consolidated our All Ireland status over the next three seasons and in 1995/96 under the captaincy of Diarmuid Reddan and the coaching team of Larry Greene, Jed O’Dwyer and John Hogan, we captured the AIL Division Two title going undefeated in the league campaign. We played two seasons in Division One but were relegated to Division Two in 1997/98 in dramatic circumstances at Tom Clifford Park against Young Munster. We returned to Division One in 1999/2000 but on this occasion only lasted one season in the higher division. We have been competitive in the All Ireland League ever since, reaching the Division Two final in Lansdowne Road but were defeated by Dolphin. The Club reached the Munster Senior Cup Final again in January 2009 and despite putting on a superb display of attacking rugby were very unlucky to go down to strong Cork Constitution side. At Junior level, our Third XV captained by Mike O’Mara and managed by Eugene O’Riordan won the All Ireland Junior Two Millennium Cup in 2001/02. The Club was again honoured when Mike Mullins was selected by Ireland in their games against Tonga and Samoa. More recently, Old Crescent was proud to see our former player Eoin Reddan make his way in the professional game. Old Crescent RFC members have made a significant contribution to the Munster Branch and the IRFU. Rev Fr Guinane, Tom Hayes, Michael Wallace, Cyril Downes, and Ken Lyons have served as Presidents of the Munster Branch, and Jim Riordan and Michael Wallace have served as Treasurer of the Munster Branch. Rev Fr Guinane, Jim Roche, Cyril Downes, Michael Wallace, and Ken Lyons have served on the IRFU Committee. Ken Lyons is currently Chairman of the IRFU Commercial and Marketing Committee. Old Crescent RFC is proud of its contribution to Limerick, Munster and Irish rugby, and the Club will continue to play an active role in the development and playing of Irish rugby football in the years ahead. Pictures above are the Old Crescent RFC, 1947-48 team, winners of the Under 20 City Cup. Back l-r, G O’Donovan, D Moloney, J Roche, N Kearney, M Collins, E Hassett, W O’Brien, T Hayes, L Nestor, S O’Sullivan. Seated l-r, M Keane, D White, P. Berkery, Captain, Rev JG Guinnane SJ, F O’Sullivan. Front row, C. Downes, J. Leahy.